Cabernet Sauvignon by Bleasdale of Langhorne Creek. . Bleasdale are Australia's second oldest family owned winery, established 1850 by English migrant Frank Potts. The Bleasdale vineyards are fortuitously planted on the fertile flood plains of Bremer River, a confluence of auspicious terroirs and clime which yield the most superlative wines year after year. An excruciatingly limited release Cabernet Sauvignon, assembled around a core of elite parcels picked off the Bleasdale estate Mullianna and Reed Patch Blocks. Established in 1850 by English migrant Frank Potts, the Bleasdale vineyards are situated on the fertile flood plains of the Bremer River which run parallel to Langhorne Creek. The area is a low rainfall, cool climate region which produces outstanding wines year after year. Ironically, it was Frank Potts abilities as a sailor that led him to Langhorne Creek to live the life of a landlubber. He saw the potential of the region when he explored it in the 1850s, convinced that the stands of tall red gums promised fertile soils and reliable water. Being a nautical man, it's not surprising that Frank Potts chose to plant a vineyard in a place that for a week or two occasionally becomes an inland sea. He planted his first vines in 1858 selling wine to Thomas Hardy, before expanding his holdings to 30 acres in the 1860s. Since Pott's founding efforts, Langhorne Creek's alluvial soils and favourably cool climate, nurtured by maritime breezes, has attracted many famous winemakers. Langhorne Creek experiences natural floods from the high rainfall that gushes out of the Adelaide Hills and heads towards the sea from time to time. It occurred to Frank that with the addition of floodgates across the river he could control the water for a short period and give his vines a deep soaking drink just before the parching Australian summer. Langhorne Creek receives an average annual rainfall of just 380mm per year and flood events provide enough moisture in the rich deep soil profile of the flood plain to carry vines in these areas through the dry summer months. The majority of the vast vineyard plantings use modern and efficient drip and sub-surface irrigation practices to maintain the water needs of the vines. Bleasdale is today still owned and operated by the Potts family, the fifth generation of winemakers. They lead a dedicated winemaking and cellar team who are very proud of their work. When you've been around for six generations of winemaking you accumulate innate viticultural skills and an affinity to the environment. Access to water, coupled with cooling breezes from Lake Alexandrina reduce evening temperatures and provide mild even growing seasons, making Langhorne Creek the ideal wine growing region. Despite this, much of the Langhorne Creek's fruit went into multi-regional blends and wasn't acknowledged until the 1990s when a small group of long term family growers, including Bleasdale, started promoting pure Langhorne Creek wines. Traditionally a red wine grape region best known for full bodied Cabernet Sauvignon and Cabernet blends, as well as elegant Shiraz, the region also produces exceptional white and fortified wines. Langhorne Creek is now the centre of a vibrant grape growing and winemaking community which regularly wins national and international awards. 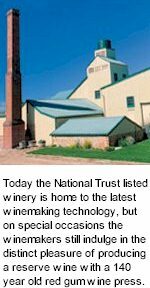 The historic Bleasdale cellars, constructed from red gum and limestone, have been classified by the National Trust and are listed on the State and National Heritage Registers. The ancient winery houses a massive red gum lever press which fifth generation winemaker, Michael Potts still uses once a year to make a small batch, limited release wine. Whilst Bleasdale is steeped in yesterday's history it has been outfitted with the latest technology. Today's winery still abides by the family traditions, retaining the philosophy of producing honest, consistent and reliable wines. Watch for the cobwebs as you clamber down the old redgum ladder into the bowels of Bleasdale winery. Duck your head and enter the old domed cellar built in 1892 and gaze around the walls at French and American oak puncheons, hogsheads and barriques, brim full of Cabernet and Shiraz. They are all destined for Bleasdale's super premium Frank Potts and Generations flagships, but that's years away. For now each parcel of each variety is matured separately, with up to 200 different wines all expressing their own individuality based on microclimate and soil. Wander on to the redgum tasting bench where in September every year you'll find the team murmuring as they taste and spit wine samples. This exhaustive three day examination of every parcel, aided by two independent judges, will create the script for each final blend to be assembled. The outcome is not just about art and romance. Local growers wait anxiously for this time of the year when they know how their fruit will be graded and whether they receive a bonus for quality, rather than tonnes produced. It's the way it should be, in the pursuit of quality.